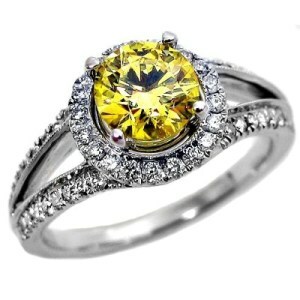 The canary diamond is the most pure vivid yellow diamond. Yellow diamonds in general come in four categories (often sub-divided further). In order from lowest to highest-grade hue are Light Yellow, Fancy Yellow, Intense Yellow, and Vivid Yellow. The higher the grade of hue, the more brilliant and valuable the diamond and only the vivid yellow is known as a true canary diamond. True canary diamonds make up only about 0.1% (1 in 1000) of all known diamonds, making this an extremely rare diamond that, combined with high demand, can be difficult to purchase. Nevertheless, the canary diamond engagement ring remains a popular commodity on the diamond market because of the sheer brilliance and color of these diamonds. A canary looks its best in a setting that allows as much light exposure as possible. 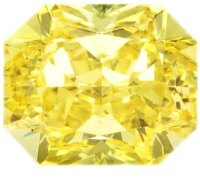 This accentuates the intense vivid yellow unique to this brilliant diamond. When looking for a canary diamond setting, try to avoid enclosed settings that surround much of the gem such as bezel or channel settings. These settings are excellent for some gemstones and styles but will smother the brilliance of canary diamonds. For extremely vivid canary stones, try to avoid yellow gold and opt for platinum or white gold that will contrast and bring out the intense yellow of the canary. On the other hand, for less vivid grades of canary diamonds, a yellow gold setting can enhance the diamond's appearance. However, this rule is not always true and it depends on the intended effect of the specific jewelry piece. Where to Buy a Loose Canary Diamond? James Allen is the online authority for loose Canary Diamonds. You can choose your diamond, view the exact stone from all angles in 3-D, and design your own ring. Cut is arguably the most important characteristic of a canary diamond. This is because the cut is the single most important factor for a diamond's brilliance. Sometimes the cut quality of a stone is sacrificed in order to maximize raw carat weight. For canary diamonds it is particularly important to avoid such cases. The canary diamond should always prioritize cut over carat weight because brilliance is the trademark of the canary. The price of a diamond generally rises exponentially with it's carat weight. Not surprisingly, a higher carat canary diamond can easily be one of the most valuable gems on the market while lower carats, thought still quite costly, are considerably more affordable. A canary diamond engagement ring will often have the highest carats of these breathtaking diamonds but If there is ever a trade-off between cut quality and raw carat, always prioritize the cut because the canary is distinguished by its vivid brilliance. A higher grade of clarity is always more desirable but because of it's deep color, a canary is considerably more lenient regarding some blemishes and inclusions. It is possible to obtain a quite stunning canary diamond at a bit lower grade of clarity than one would consider for, say, a white diamond. Keep this consideration in mind if you are searching for canary diamonds on a limited budget. As previously mentioned, a lighter yellow diamond is not considered a true canary diamond and is considerably less valuable. 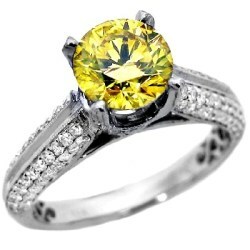 Likewise, within the range of true canary diamonds, the darker and more vivid the yellow hue is, the higher its value is. Because it is this deep yellow that makes the canary so stunning and unique, color should always be a high priority when searching for your canary. Due to it's rarity and vivid yellow hue, a good grade canary diamond is currently one of the most costly diamonds, easily surpassing an equivalent white diamond in value. The hefty price tags for canaries keep these gemstones out of the range of a significant number of diamond buyers. However there will probably never be a better time to buy this gemstone than now. There is no indication that the current supply of canary diamonds will improve and by all accounts, the demand for these diamonds will only increase, causing prices to skyrocket further. Therefore, due to the state of extreme rarity and raising demand, canary diamonds are likely one of the best diamonds to invest in if you are ever intending to resell. In short, if you are considering purchasing a canary, despite its already high price, there will likely never be a better time to buy then now.